Hamilton musical creator Lin-Manuel Miranda rapped his way down memory lane on Friday as he was given a star on the Hollywood Walk of Fame. 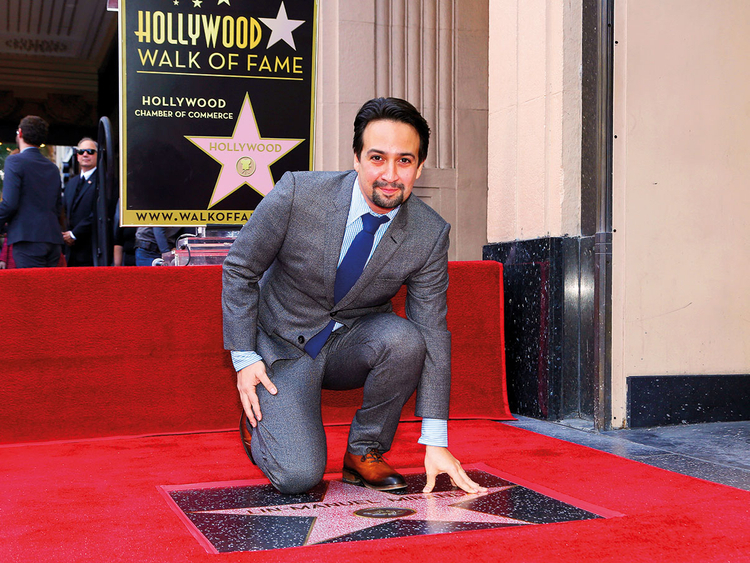 The multiple Tony, Emmy and Grammy winner unveiled his pink and bronze star outside the Pantages Theatre in Hollywood, where he recalled performing in his first hit musical, In the Heights, in 2010. Hamilton, the rap musical in which African-American and Latino actors play the founding fathers of the United States, won a Pulitzer prize and is currently the most successful show on Broadway, with productions also in London, Chicago and a US national tour. Miranda has also been busy with other projects. He is co-starring in the upcoming movie Mary Poppins Returns, he co-wrote the music for the animated film Moana, and he is working on a new musical movie version of The Little Mermaid. He has used his fame to raise money for 2017 Hurricane Maria relief efforts in Puerto Rico, the home of his grandparents. “In spite of his astronomical success, he has somehow managed to remain a sweet, humble, down-to-earth guy,” comedic singer-songwriter ‘Weird Al’ Yankovic said at the ceremony.